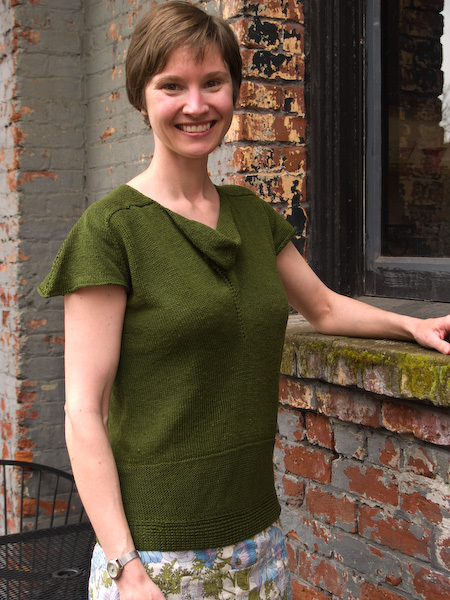 In July of 2009 I started a green linen top from a 1932 pattern collected by Jane Waller and Susan Crawford. I ran aground when I realized it was going to be far too short in the torso and so I put it aside. Last April I picked it up again, bought another skein of Euroflax, and figured out a solution. But by the time I was finished, I was too pregnant to fit into it. Into the drawer it went, where it rested patiently all summer, fall, and winter. And now, at last, it can take its proper place in my wardrobe. I love it! Linen is a fiber that demands its pound of flesh up front: it’s rather hard on the fingers during the knitting. But it just gets better and better with wear, and it should last forever. Want a closer look at the bit I had to re-engineer? Sure you do. Verdict? I love this top. Every so often I swear off knitting summer garments because they always disappoint me, but this is an exception. And I’m still so enamored of this shade of green. I’m going to be wearing this all summer… as soon as it stops spitting rain and gusting wind, that is. Hello! We are the same, but different! 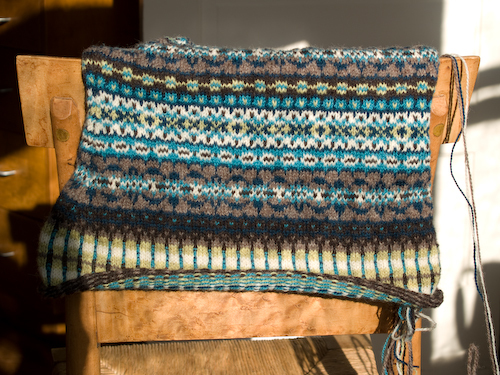 Don’t you just love how a few color shifts can totally change the effect of a Fair Isle-type pattern? 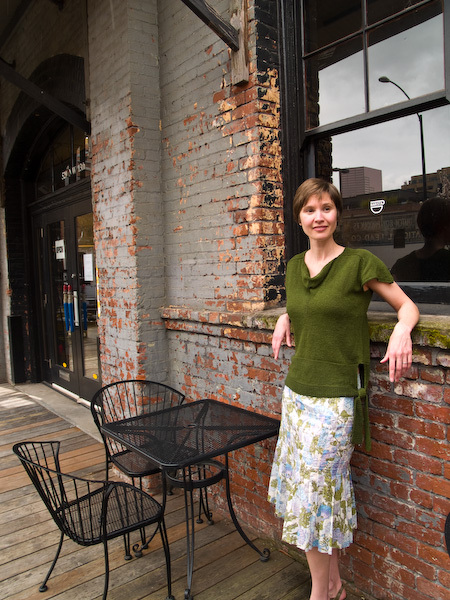 Two of our lights and two of our darks are quite similar, but the two other colors — chartreuse vs. mauve, chocolate vs. burgundy — and the brightness of Katrin’s white and blues give the two vests very different feels. I’ve already worn mine about four times. Long live the Annual Christmas Knitting Exchange! 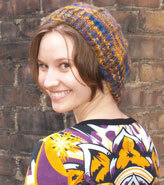 The idea is that we choose a pattern we both want to knit, select the yarn we want to end up wearing, and swap. Then the knitting begins. So last year I got to work with the glorious Luscious Silk Single from Blue Moon Fiber Arts, and I’ve had a whole year of pleasure in wearing my sweater of Blue Moon Twisted. 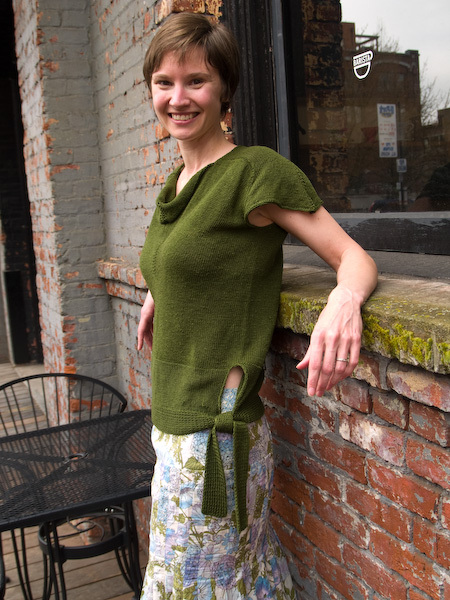 We kicked around a bunch of ideas for this year’s pattern, but finally settled on Eunny Jang’s Ivy League Vest (Interweave Knits Winter 2007) after discovering that we each had ample stash possibilities for this project. I believe we bought an extra skein each, but that was it! Mine are almost all Jamieson’s Shetland Spindrift; Katrin’s are a hodgepodge of Hifa II, Satakieli (which I brought her after I went to Knitting Camp), and Elemental Affects Shetland. (Imagine a springy chartreuse rather than that dull yellow, will you? The other colors are accurate.) Here it is on Ravelry if you want to keep track of my progress. I am juggling it with three other holiday gift knits, but I’m feeling strong for a timely finish, even given the STEEKING that has to happen and the MANY, MANY ENDS I’ll need to weave in. (Note to self: For the love of Pete, girl, give that spit-splicing method a try.) I’m already at the V-neck shaping, and the armscyes are coming along in just a few rounds. 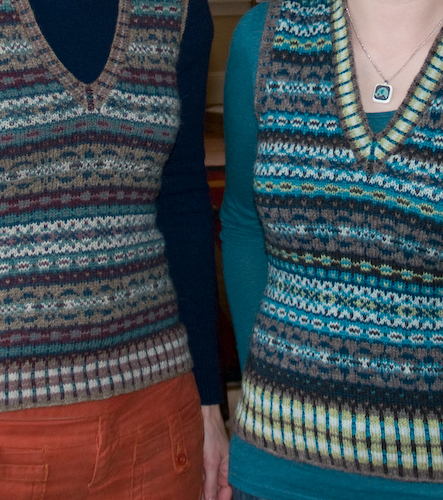 Mods: Those among you who have already knit this vest will notice there’s an extra large-pattern band in there. K & I thought the version in the magazine looked suspiciously cropped, and we’re both fans of that comfortable overlap of sweater and jeans that prevents cold drafts and peeping eyes from finding one’s upper bum, should one choose to bend over. Thus I’ve lengthened K’s vest by casting on the next-largest size and working an extra peerie and an extra large band, while decreasing at the rate directed down to a stitch count that would give me the desired waist size. Then I was back on track to proceed with the bust increases for the target size.